The 2016 24-mile Tampa Bay Marathon Swim was stopped mid-way by high winds. 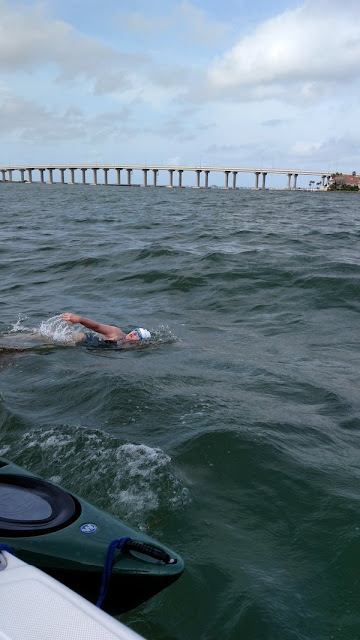 "With winds that gradually increased, the conditions led to a change of the cross-bay swim to a safer triangular contingency course." But even the sheltered course was too much. "After battling for almost three and a half hours on an alternate course, we decided to halt the marathon swim due to safety concerns for the swimmers, boaters and kayakers," describes race founder Ron Collins. Collins was the first person to swim across Tampa Bay in 1998 and started organizing the event the following season. Over two decades overseeing the longest sea swim in America, he has seen nearly every condition possible in Tampa Bay on the west coast of Florida. The 2017 Tampa Bay Marathon Swim will be held on April 22nd with hopes for more favorable conditions.